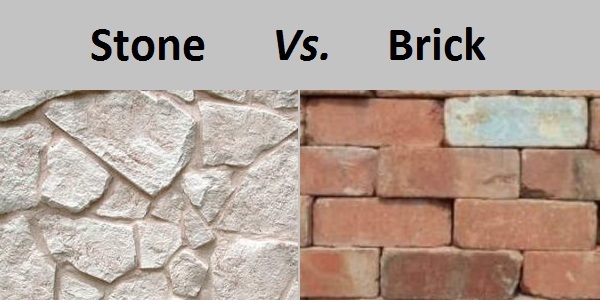 Distinguish, differentiate, compare and explain what is the difference between Stone and Brick. Comparison and Differences. 1. Stone is having less porosity. Brick is more porous than stones. 2. Stones are heavily weighted. Bricks are light in weight than stones. 3. Stones are having higher crushing strength up to 150 to 1000 kg/cm2. Bricks are having lesser crushing strength than stories and up to 105 kg/cm2. 4. Stones are much durable than bricks. Bricks are less durable than stones. 5. Stone should not absorb water more than 10% of its dry Weight when kept immersed for 24 hours. Brick should not absorb water more than 20% of its dry weight when kept immersed for 24 hours. 6. Stones are mainly used for foundation work. Bricks are mainly used for masonry work or wall construction. 7. Stones are having less resistance against fire than bricks. 8. Stones are costly and not available easily. Bricks are cheaper than stones and easily available.